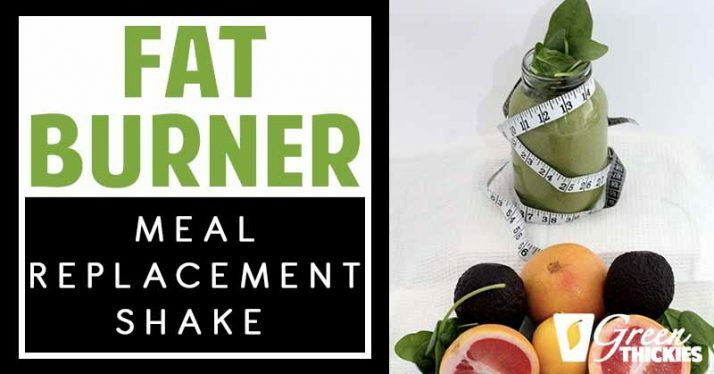 This Creamy Citrus Fat Burner Smoothie can also be easily turned into a complete meal replacement if you include the optional extra healthy fillers such as oats. You can also easily convert this smoothie into a protein shake by including the optional natural plant based protein such as nuts or seeds. You can turn this recipe into a green smoothie by including the optional leafy greens in this recipe. Are you fed up of those extra pounds that just won’t shift? Do you want to kick start your weight loss and rev up your metabolism? 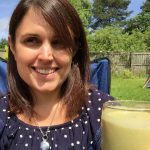 Do you want a quick healthy breakfast that you can drink on the go, fill yourself up with and get in your fruit and veg for the day? 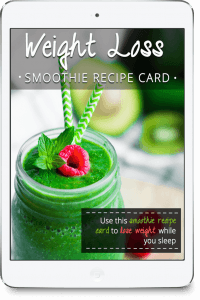 This weight loss smoothie recipe is the perfect meal replacement to help you on your way to a slimmer body. I have been waiting such a long time to share this smoothie recipe for weight loss with you. This is because I’ve been testing this recipe for ages. Every time I started drinking this smoothie, the next day I had lost 2 pounds. I tested this smoothie numerous times especially after a weekend indulgence and it always had the same effect. I then went away for 3 weeks and gained 7 pounds. Now I’m back and the very first thing I wanted to do was make another batch of my weight loss smoothie and share this recipe with you ASAP! Another reason I kept ‘testing’ this recipe is that it tastes absolutely gorgeous. It’s definitely one of my top favourite smoothie recipes ever. I would be quite happy if I only had to drink this smoothie for the rest of my life. It’s honestly that good. This smoothie does not taste like a weight loss smoothie. It is creamy, luxurious, with a fresh citrusy undertone and just the right balance of sweet and sour. It’s not overly sweet, and even though I have a really sweet tooth, the taste of this smoothie suits me perfectly. I’m sure you’re going to love it. And if the food that is good for us happens to help us lose weight and tastes amazing, then that’s got to be a bonus? This is not a low fat smoothie for a very good reason. Did you know you actually need to eat HEALTHY fats to lose weight? If you eat a low fat diet your body actually keeps hold of more of your fat stores. We also need healthy fats for many essential bodily functions. And healthy fats will fill you up helping you to reduce your cravings. If you want to learn what foods are actually good for you and how most diet advice we’ve been hearing for decades is actually harmful for your body, you can read Good Calories, Bad Calories: Fats, Carbs, and the Controversial Science of Diet and Health. 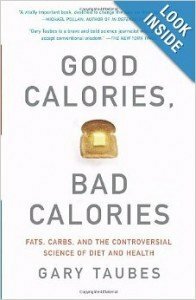 This book explains more about how eating fat INCLUDING SATURATED FAT is actually good for you, and how low carb diets are to be avoided. Although I don’t count calories to lose weight, I do believe it can be helpful to be aware of the calories in your food when you are trying to lose weight so you can get an idea of portion sizes and plan future meals accordingly. I am a big believer in eating real unprocessed food, and when you fill up on these types of foods it is much easier to lose weight. However some people can still struggle with their weight despite eating all the right foods, so it may help to look at the number of calories you need and try and eat less than your body needs. Now if you take 500 calories off your daily energy expenditure figure, you should lose 1 pound a week. However not all calories are created equal so if you’re still eating processed foods you may still struggle to lose weight. If you are eating whole unprocessed foods you may find that you lose more weight especially at the start of your diet. If you want to lose more weight than 1 pound a week then I would suggest increasing your exercise rather than decreasing your calories. This smoothie contains 483 calories which is a substantial filling breakfast that should keep you going all morning. Avocado: Avocados are loaded with healthy Omega 9 fatty acids, speed up the conversion of fat into energy and boost the rate of metabolism. Coconut: Coconut is rich with medium chain triglycerides which increase the liver’s rate of metabolism by up to 30 percent. Coconut also helps keep you full so you’re less likely to overeat unhealthy food. Coconut oil also improves the functioning of the thyroid gland. Lemons: Lemons are excellent liver detoxifiers, and alkalize our body. They may seem acidic based on taste but in the process of being metabolized by the body, they actually alkalize our bodily fluids and tissues. Maintaining the health of the liver is also essential so that the body can digest and burn fat, since the liver is one of the organs responsible for these functions. Grapefruit: Many studies show that grapefruit is an excellent weight loss food. In one study at Johns Hopkins University, women who eat grapefruit daily shed almost 20 pounds on average in only 13 weeks, without changing anything else in their diet or lifestyle. I don’t usually enjoy grapefruit but it’s so subtle in this smoothie and adds a delicious tang. 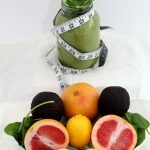 For those who don’t want to add grapefruit into your smoothie, you can get all the benefits from grapefruit without the taste by adding grapefruit powder. I actually added both grapefruit and grapefruit powder to my smoothie for extra benefits. You can get grapefruit powder and read about some amazing health benefits here. Some people taking certain medications can’t eat grapefruit so please check your medication and you can substitute the grapefruit for orange in this recipe. Green Tea: Green tea is amazing for fat busting. EGCG increases the rate at which fat is burned in your body. Research at Tufts University indicates that EGCG in green tea, activate fat-burning genes in the abdomen to speed weight loss by 77 percent. Green Tea also keeps energy stable by balancing blood sugar levels. EGCG improves insulin use in the body to prevent blood sugar spikes and crashes that can result in fatigue, irritability, and cravings for unhealthy foods. Leafy Greens: Leafy greens are very high in fiber, which can help make you feel full for longer, as well as improving your digestion. They are very low in calories and carbohydrates, and can be eaten in large amounts during almost any kind of diet. Leafy greens also have a low glycemic index, which means that they hardly effect blood sugar levels and can even help lower the effects of other foods when they are eaten together. This effect allows you to avoid blood sugar crashes as well as preventing diabetes, improving the chances of sticking to your diet and losing more weight. So although the greens are optional in this smoothie, they are highly recommended. Oats: Oats are loaded with fiber that decreases your appetite by making you feel full so you can go for long periods of time without eating while keeping your energy levels high. The addition of oats to this smoothie makes it a complete meal replacement smoothie. If you leave out the oats, you are more likely to get hungry and need something else to eat. Replacing your breakfast is a great start to improving your health and constistently losing weight, but for many people this isn’t enough. 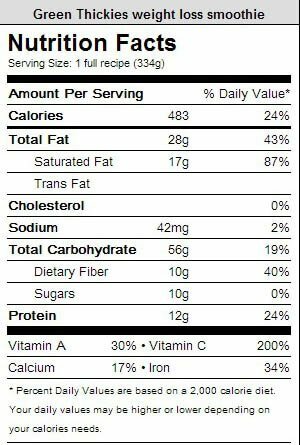 I know you’re probably wondering what to eat for the rest of your meals? For that reason I have created a FREE 12 week e-course to help you lose weight and get healthy. 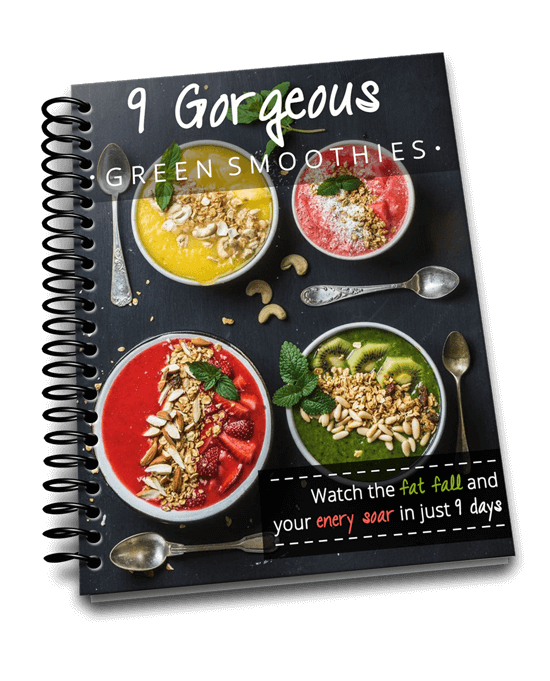 The e-course will get you started with green smoothies and provides you with 3 FREE diet plans you can follow to lose weight. Get the FREE e-course now. Can’t wait that long? I have you covered too. 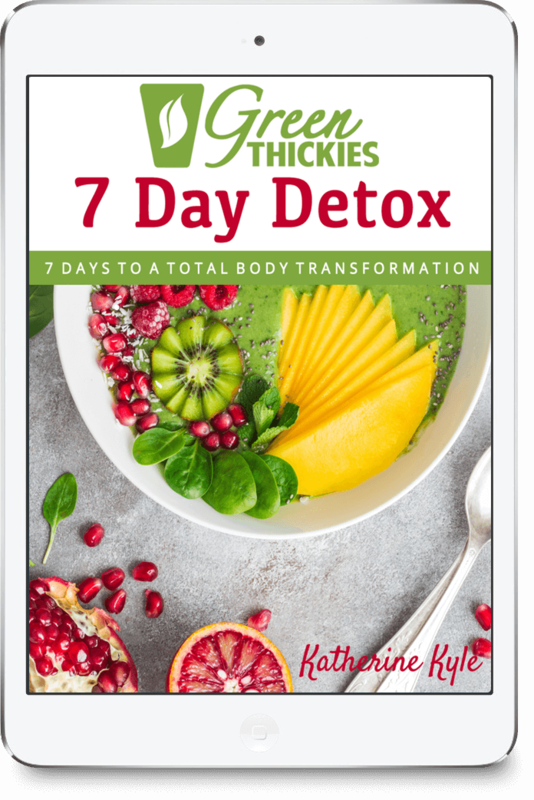 Get Green Thickie’s 7 Day Diet Plan for weight loss and improved health for a full meal plan to help you lose weight. 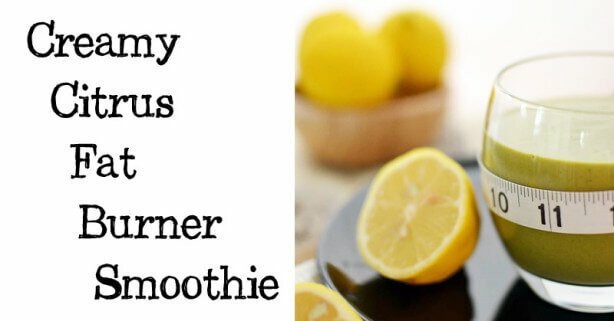 This Creamy Citrus Fat Burner is a Weight Loss Smoothie designed to melt that fat before you know it. If your smoothie is too warm, you can cool it down in the fridge or freeze some of your ingredients before blending. You can also replace half of the liquids with ice. Add the ice at the end. It is better to add frozen ingredients at the end to cool the smoothie down. – Only use a meal replacement if you’ve added the oats/quinoa. – This Green Thickie serves 2 so you should DRINK HALF OF THIS RECIPE. But if you have higher calorie requirements you may need to drink more. What is your favourite way to boost your metabolism? I just made this. I put it in the fridge to get colder. I do have a bit of a cold these days so my taste buds aren’t so strong and right now i don’t taste much in the smoothie, but it does look creamy and delicious! Can’t wait till it gets cold to enjoy it. Thanks! I made this yesterday. It kept me so full! I really wasn’t hungry at all. I sipped it throughout the morning and the 2nd half I had in the afternoon. I have a cold so the flavors weren’t as strong to me. But I did enjoy it. Thanks! I’m going to try this- am I correct in assuming the oats are cooked first? I don’t cook the oats, takes a lot of the nutrients out. No me neither – they’ve already been pre-cooked anyway so I don’t think it makes too much difference. No – oats are pre-cooked so you don’t need to cook them. I don’t have any coconut milk, will soy milk work and still have the weight loss effect? I’ve been using light soy milk and its delicious! I drink this most every morning. Yay that’s great Liz – I’m so glad you like it. Thank you for letting me know. I take medications that do not allow grapefruit in any form, something people should be made aware of. Please indicate an appropriate replacement for the grapefruit and how much. Thank you. I’m on medication also that does not allow grapefruit either – would be keen for a substitution as well. Can any citrus be used in replacement for the grapefruit? Yes no problem – Orange would make a great substitute. Thank you for letting me know. You could use 1-2 oranges instead of the grapefruit. Hey! I saw the bella twins on total divas weeks ago, having this “go green go” diey, in which they eat/drink nothing but a green smoothie. I tried to find the recipe but I couldnt, can I drink this every day as a meal replacement, and eat nothing else? Just live on this smoothie and water? If no, then what kind of smoothie can I drink everyday as a meal replacement? And how many cups can I drink a day? I apologize for the load of questions. Yes there’s nothing stopping you just having a day where you just have green smoothies. I have done it several times. You could definitely do it with this smoothie. I would say just drink it until you aren’t hungry. Is the quinoa cooked before added to the smoothie? Same question as Beth….what to do with quinoa????! I do not drink coffee. Can I use de-caf green tea? Yes – use de-caf. I use that myself most of the time as I can’t tolerate caffeine either. Hi, Katherine, I have had my first Citrus Smoothie, and found it quite unique. I put my greens into ice cubes by steaming them slightly, then blending with a little water, and freezing in an ice cube tray. The ice cubes cool down the tea if it isn’t already cool. Thank you. Hi, Katherine, I have a couple questions. Don’t you lose some of the nutrition by leaving it overnight? Especially if using the Vitamix that takes the fruit and veggies down to the “molecular level”. I want to get as much of the available nutrition as possible, so I drink mine right away. May I ask why you wait until the next day? Is there something I’m missing? Also, I have tried making some of these green smoothies, I like the flavor, but I do have an issue. I want to be able to make the meal replacement smoothies for weight loss, drinking one for breakfast and one for lunch. But the solids in the one I don’t drink right away tend to separate, making a very thick clump at the top of the bottle, leaving an almost clear liquid at the bottom. I end up having to re-blend to make it palatable, otherwise I end up with a “green chunkie”, and without the re-blend it is gross! Any ideas for that? or have you experienced that with yours? Yes you do lose some nutrients leaving it overnight but if the alternative is not having something healthy I choose my Green Thickies. Depending on what filler you use sometimes it can separate overnight. I simply give it a quick shake (in a smoothie cup) or get a fork and give it a quick stir and that works well for me. Creative! I am featuring our recipe on AFW this week! Thank you so much for featuring my recipe Tessa! I made this this morning for myself, and before my picky son absconded with it, it was delish! We did change it a bit, used orNge instead of grapefruit, gelatin instead of oats/quinoa, half stevia for sweetness, a touch of vanilla, and a 1/3 of a lemon…the whole thing with peel. Anyway, loved it and look fwd to trying it with grapefruit too as it comes into season! That’s great Tessa! I’m so glad you liked it. Thanks so much for letting me know! Yum, this smoothie looks great, and the fat burning info is super helpful! This is great info especially as we head right into the holidays! Thank you for sharing this with us at the HomeAcre Hop. We’d love to have you join us again tomorrow. Thanks for sharing at vegetarianmamma.com’s #glutenfreefridays link up! Hi I understand you are based in the UK. just wondering why your links to products take me to American sites?? Are there not UK suppliers of these items? Hi! I love this smoothie. I drink up two serving in the morning, half a serving at lunch time and another half in the evening coupled with some small-small dinner. First day I though oh wow I’ll never be full just drinking this… I was wrong. Really wrong. I do change it up a bit: only half a lemon and substitute the grapefruit with oranges since it comes a bit too lemony/bitter and leaves my throat hurting. I’ve not stepped on a scale and am measuring myself with the jeans I wish to wear during X-Mas. I definitely recommend! Merry Holidays & Green Smoothies! That’s great Marge! I’m so glad you are enjoying it and it’s filling you up. Happy Christmas to you too! How do you add the oranges or grapefruit? Just peel and throw in or leave peel on? I cant wait to start this tomorrow! My brother just shipped us fresh CA oranges off his orange trees in his backyard and we werent sure how we were going to eat them all! Yes you peel them first. Hi. I’m trying to lose my baby fat. I can’t wait to try this. Wanted to know if 1. its still effective without the grapefruit powder, or 2. can it be replaced with grapefruit seed extract? Wanted to do the 7day challenge , but couldn’t get the ingredients till tomorrow….looking forward to giving this a try! I just did the daily expenditure calorie calculation (I’m 69, weigh 132.8, 5 ft tall). The result was just over 900 calories a day. Does this actually mean I’m to subtract 500 calories from the 900? I want to do this correctly, but that seems a really drastic reduction! I hope you can give me some guidance on this! Hi there….I just made this, and it seemed a bit watery! What am I doing wrong? I think I measured it all out correctly! However, the coconut milk was half solid half liquid…maybe that’s the problem? Well, I have my own problem with this recipe. I not only need to lose weight, but I have acid reflux, which means no citrus and no green tea (no caffeine). So now what? i just made this for the first time ever. it tastes wonderful, or it would have, if i had been using ordinary milk instead of coconut milk, it just tastes WAAAY to much of coconut. ruins it a bit for me. will try using ordinary milk next time. I am little confused by the filler part of this recipe. If an avocado is already a filler do I still need to pick another filler as part of this recipe? I would like to try a sweet potato instead of Oats, would rather stick to the recipe especially if the taste will change drastically. You can add extra avocado or oats or sweet potato, each will alter the taste slightly however that is the beauty of Green Thickies, there are so many combinations, it is great fun finding your favourites. If I don’t drink tea what is a good substitute? Hi Joe, for this particular recipe the green tea is an important fat-burning ingredient. However there are many more Green Thickies that do not use green tea, indeed, most are completely caffeine free. I’ve made this twice and it’s horrible. Using exactly the same measurements as provided and using quinoa as the filler. I can’t find grapefruit therapeutic grade essential oil anywhere. At least, not any you can digest. I’m sorry to hear it isn’t working for you. The oil does depend on which country you are in. In UK no therapeutic oils are recommended for ingestion due to very strict European testing laws, even if approved elsewhere. However Young Living Grapefruit oil is classified as food grade in the US and this is the only oil Green Thickies recommends.